Party per pale 1 Azure, an Angel Argent, crowned, crined and vested Or holding an open Book Argent; 2 Or, three Horse's heads Sable, couped, in pale. 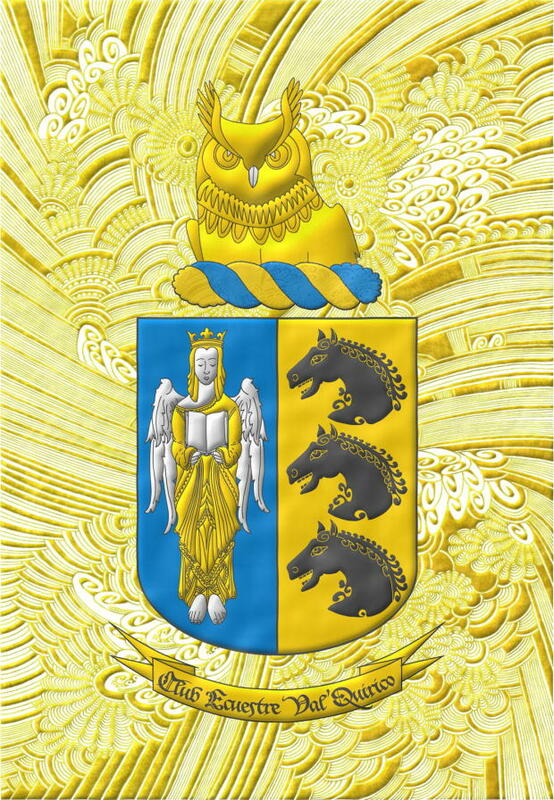 Crest Upon a Wreath Or and Azur, an Owl's head couped at the shoulders Or and beaked Argent. 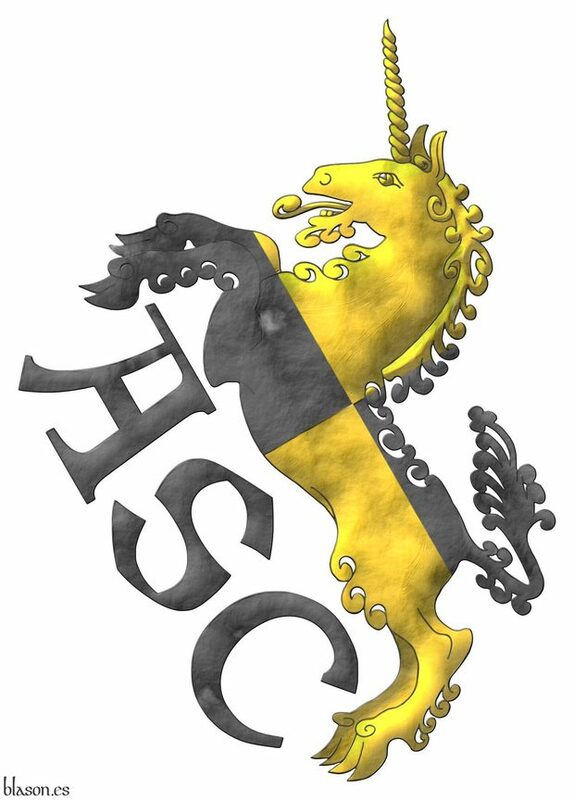 Motto «Club Ecuestre Val’Quirico». [Académie internationale d'héraldique; 1952; pages 38-39, picture 517] shows the translation torse or crest-wreath or wreath ~ burelete. 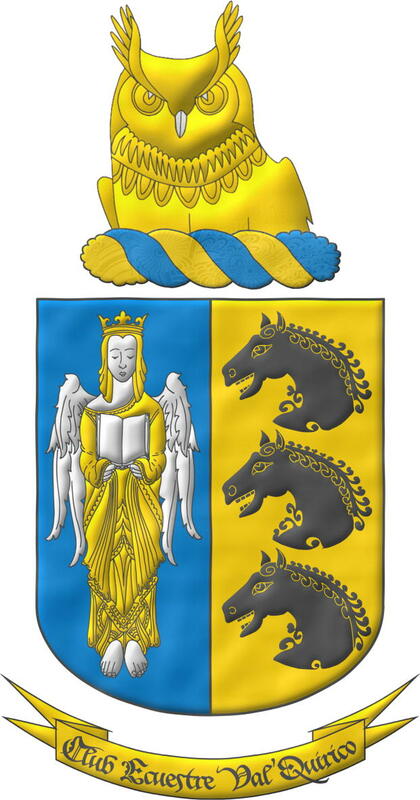 Blazon keywords: Party per pale, Azure, One, Angel, Argent, Crowned, Crown, Crined, Vested, Or, Charged, Book, Open, Three, Head, Horse, Sable, Couped, In pale, Crest, Wreath, Owl, Nascent, Beaked and Motto (identification). Style keywords: Watercolor, Illuminated, Rounded, Outlined in the field tincture and Outlined in sable. 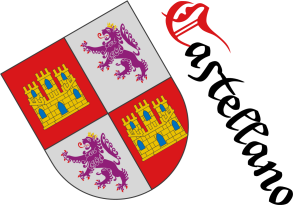 Blazon keywords: Party per pale, Azure, One, Angel, Argent, Crowned, Crown, Crined, Vested, Or, Charged, Book, Open, Three, Head, Horse, Sable, Couped, In pale, Crest, Wreath, Owl, Nascent, Beaked, Mantling, Diapered and Motto (identification). Style keywords: Crystalline, Illuminated, Rounded, Outlined in the field tincture and Outlined in sable. Classification: Catalogue, Created and Socioeconomic. Watercolour finish over a Chinapieria Or. Classification: Created, Socioeconomic and Chinapieria. Party per pale 1 Azure, an Angel Argent, crowned, crined and vested Or holding an open Book Argent; 2 Or, three Horse's heads Sable, couped, in pale. Crest Upon a Wreath Or and Azur, an Owl's head couped at the shoulders Or and beaked Argent. 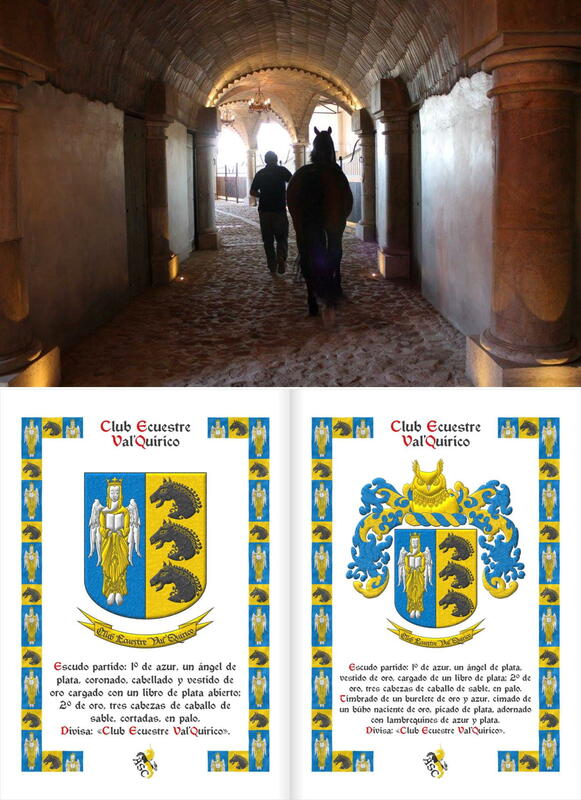 Mantling Azur doubled Or.. Motto «Club Ecuestre Val’Quirico». Classification: Photographic format, Catalogue, Created and Socioeconomic. Open, Watercolor, Old parchment, Azure, Wreath, Owl, Horse, Crined, Head, Charged, Catalogue, Chinapieria, Club Ecuestre Val'Quirico, Crown, Crowned, Couped, Created, Crystalline, Quarterly per saltire, Outlined in sable, Outlined in the field tincture, Diapered, Motto (identification), In bend, In pale, Photographic format, Personal, Illuminated, Badge, Mantling, Book, Nascent, Or, Party per pale, Hoof, Beaked, Argent, Rounded, Sable, Salmerón Cabañas, Antonio, Salient, Socioeconomic, Crest, Spot ink, Three, Unicorn, One, Vested and Angel.